SLIP ON WITH A TIE ADJUSTMENT All Terrain Work - Steel Toe Trail Running Oxford that meets or exceed ASTM F2413 Safety Standards with Electrical Hazard Protection and Slip Resistant Rubber Outsole with Trail Lugs and Flex Grooves. ASTM F2413, Slip Resistant, Electrical Hazard Protection, Steel Toe Designed to take on any terrain the work day throws at you. 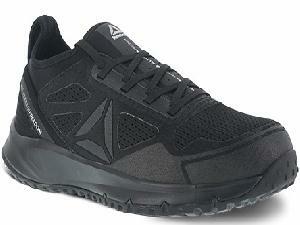 Slip on the All Terrain Work and conquer concrete, mud, rocks, and anything in between. 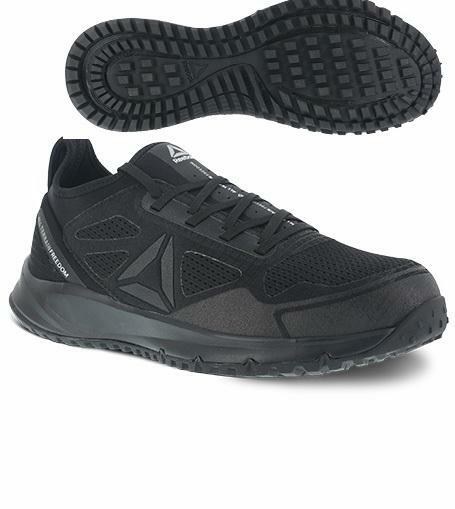 A lugged rubber outsole and gripping grooves provide traction, step after step, mile after mile. The full-foot bootie construction keeps mud and moisture out, and keeps comfort in.